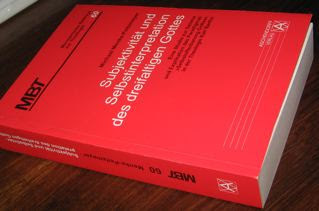 This big and ambitious book on the Subjektivität und Selbstinterpretation des dreifaltigen Gottes (“The Subjectivity and Self-Interpretation of the Triune God”) explores Karl Barth’s conception of divine self-revelation in the context of the modern problem of human freedom. Menke-Peitzmeyer rightly notes that the concept of divine self-revelation is really “the great theme of 20th-century theology” (p. 555), and he argues that the notion of the absolute subjectivity of God in his self-revelation is central to Barth’s entire theological project. It was Hegel who bequeathed to modern theology the themes of absolute subjectivity and self-revelation. In taking up these Hegelian themes, Barth was trying to overcome some of the intellectual dead-ends that had been inherent in the Enlightenment understanding of subjectivity and freedom. And according to Menke-Peitzmeyer, Barth’s own account was developed both (negatively) through his critique of Schleiermacher, and (positively) through his reception of Anselm. Menke-Peitzmeyer agrees with Hans Urs von Balthasar’s judgment that Barth “comes from” Schleiermacher: “Schleiermacher was for Barth what Plato was for the thinkers of the Renaissance, what Spinoza was for Herder and Goethe, what Schopenhauer was for Nietzsche” (p. 40; citing Balthasar, p. 199). Drawing creatively on Anselm’s thought, however, Barth sought to turn Schleiermacher’s problematic on its head, so that human subjectivity would now be grounded in the subjectivity of God. While (in Barth’s view) Schleiermacher risked turning divine freedom into a predicate of human subjectivity, Barth now reversed this problem by making human freedom a “predicate of God” (p. 48). For Menke-Peitzmeyer, however, the critical question is whether this approach really resolves the Enlightenment problem of freedom, or whether it simply “leads to new aporias” (p. 48). And he argues that Barth’s view in fact creates a new (and equally disastrous) aporia within the same basic Enlightenment paradigm. Thus Barth “misses his goal of extracting theology … from the ‘Logos’ of modernity” (p. 48). At the core of this critique is the claim that Barth’s account of divine subjectivity finally eliminates human freedom. “The incarnation of God as evidence of God’s freedom for humanity turns out to be evidence of God’s freedom instead of that of humanity.” And this means that the human agent “appears as a puppet in the divine plan of salvation” (p. 388). Ultimately, then, in Barth’s theology there is “no free relationship between God and humanity at all” (pp. 388-89). Instead of the Enlightenment displacement of divine freedom, Barth reverses the process and so leaves us with “the elimination of human freedom” (p. 415). Menke-Peitzmeyer argues that this “elimination of human freedom” was not a necessary component of Barth’s account of the divine subjectivity in CD I/1. At the early stage of Barth’s dogmatic project, he could still have avoided this aporia. But it is in the doctrine of election (CD II/2) that the aporia becomes necessary and inevitable. Further, Barth’s doctrine of election eliminates genuine divine freedom as well. In CD II/2, Menke-Peitzmeyer argues, the predestination of Jesus Christ and of humanity becomes the condition for the existence of an immanent Trinity. This means that it becomes impossible to think of God as freely acting in salvation-history. Menke-Peitzmeyer thus raises a series of pointed questions: “Is there a material difference between the immanent Trinity (and thus the self-constitution of God), and predestination as part of the self-interpretation of God – in which case predestination becomes a contingent act of God? Or is the immanent Trinity nothing other than the carrying-out of predestination? Or more sharply still: Is the immanent Trinity, for Barth, identical to God’s eternal (and supralapsarian) decree of the incarnation?” (p. 416). These questions, he insists, are of great importance, since the freedom both of God and of humanity is at stake. “If there is an identity between the immanent Trinity and predestination, that is, between God’s self-constitution and God’s self-development (or self-interpretation), … then there would be no room for a free salvation-event between God and humanity, and thus the importance of this event would be marginalised” (pp. 416-17). Perhaps the most fascinating thing about this argument is the way it intersects with the current North American controversy surrounding Bruce McCormack’s interpretation of Barth. According to McCormack, God’s triunity is a function of the divine election; it is the act of God’s decision to be God-for-us that constitutes God as triune. Menke-Peitzmeyer offers a very similar reading of the inner logic of Barth’s doctrine of election – although he concludes that this position radically compromises God’s freedom. Presumably this conclusion is not a necessary one, however, since McCormack’s own interpretation rests on exactly the opposite vision of God’s freedom. For McCormack, the thesis that triunity is a function of election is precisely an affirmation of God’s lordly freedom: in his freedom, God is Lord even over his own being and essence. In any case, according to Menke-Peitzmeyer’s argument, Barth’s doctrine of election finally amounts to “a self-manipulation of the divine love, which avoids the risk of salvation-history and thus the actual dialectical tension of the relationship between infinite and finite freedom.” In place of this dialectical tension, Barth constructs “an a priori synthesis” of divine and human freedoms (p. 547). Ultimately, then, Barth does justice “neither to the freedom of God nor to human freedom” (p. 585). Against Barth, Menke-Peitzmeyer proposes that we should speak of “the absolute subjectivity of God as the self-interpretation of the triune God”; and this means speaking “both of the self-constitution of the triune God in his immanence, and of God’s self-development in history” (p. 586). God’s subjectivity “manifests itself in God’s immanent self-interpretation, which is carried out in the epiphenomena of salvation-history” (p. 547). In this whole argument, Menke-Peitzmeyer is following critics like Pannenberg, Trutz Rendtorff, and Peter Eicher, who have argued that Barth’s theology remains ensnared in the fundamental problems of modernity. While among Anglo-American scholars today, there is an increasing tendency to see Barth as an advocate of Chalcedonian christology and evangelical orthodoxy, certain scholars in Germany have continued to advance radical critiques of Barth’s theological project, and have continued to argue that Barth’s theological ontology is systemically flawed. In particular, scholars influenced by Rendtorff and Pannenberg (whose opposition to Barth is fundamental) have argued that Barth’s response to the Enlightenment is inadequate, and that Barth’s account of divine and human freedom is incoherent. On the one hand, then, Menke-Peitzmeyer’s book is of great value precisely because it so clearly embodies and develops this radical German reading of Barth. On the other hand, however, Menke-Peitzmeyer’s critique suffers acutely from its isolation from major developments in recent English-language scholarship. To mention the two most important examples: John Webster’s meticulous work on divine and human agency poses a systematic challenge to this interpretation of Barth; and Bruce McCormack’s groundbreaking work on Barth’s genetic development poses fundamental problems to Menke-Peitzmeyer’s rather schematic depiction of Barth’s early development as a straightforward negotiation between Schleiermacher and Anselm. But in spite of these problems, it would be a mistake to dismiss Menke-Peitzmeyer’s argument out of hand. His critique is based on a painstakingly close and patient reading of Barth, and on a deep wrestling with the internal grammar of Barth’s dogmatics. He rightly perceives that, for Barth, the most important and far-reaching dogmatic decisions are made not in the prolegomenon (CD I/1) but in the doctrine of election (CD II/2) – and he rightly perceives that Barth’s doctrine of election is aimed at nothing less than an entire ontology of divine and human agency. Even if this book’s conclusions are ultimately unconvincing, then, they still provide a vigorous and welcome challenge to the complacency of our (sometimes all too easy) “orthodox” readings of Barth.